In three minutes, the Charm ROSA QUIN test detects 11 quinolone drugs in milk. The QUIN test is run by farmers, veterinarians, truck drivers, milk receiving, and milk testing laboratories because of its speed, ease of use, portability, and minimal equipment requirements. 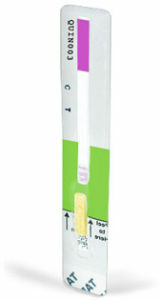 This 3-minute Rapid One Step Assay is performed with a lateral flow strip in the Charm EZ system. Add sample to the EZ system, close the door, and the sample will be automatically read as negative or positive. The test also can be performed with a ROSA incubator and read on the ROSA Pearl-X Reader. Detects five quinolone drugs in milk at or below the EU MRL. Central Reference Laboratory (CRL) guidelines available upon request.